The last days of August have found me busy trying to finish up with apples. When we first planted our two apple trees I wondered if the two semi-dwarfs would produce enough. I'm not thinking that now! I've been canning apples slices, freezing pies, and making applesauce. The other day I made apple butter from a recipe I found in my Ball Blue Book. This book is a classic standard guide to food preservation. It's been around since 1909, but they seem to come out with a new edition every so many years with up-to-date information and new recipes in each one. The recipe I used came from the 1999 edition, but I tweaked it quite a bit. I cut the sugar in half, doubled the spices, and omitted the lemon juice. About the sugar. Yes, I know all sugar is bad for you, but I don't produce enough honey to replace it entirely, so I compromise. 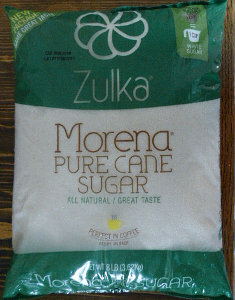 I buy an unbleached cane sugar instead of standard white sugar. What's the difference? Legally sugar can be either cane sugar or beet sugar. Since all the sugar beets grown in the US are genetically modified, I choose cane sugar over it. In addition, this brand is unbleached, economical, and widely available. Plus I like the sustainable way Zulka manages it's sugar production (you can read about that here.) Okay, so much for the pitch; on to the recipes. 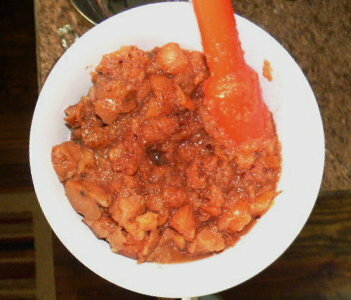 Mix applesauce, water, and spices in a crock pat. Caramelize the sugar and add. 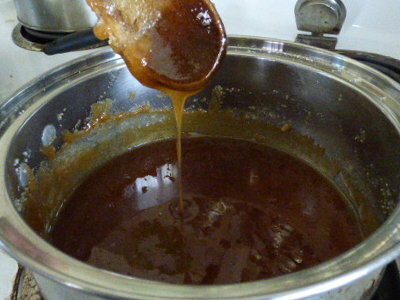 To caramelize the sugar, simple heat it in a pan and stir continually to keep it from burning. 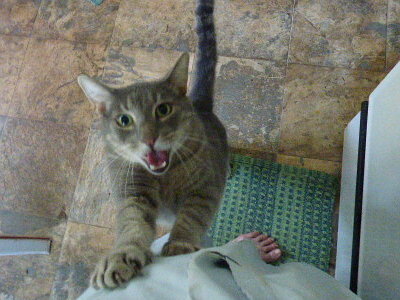 Do not be distracted from your task, even if the cat tells you he's starving to death. Riley: "But I am starving to death!!!" Eventually the sugar will melt into a thick caramel brown syrup. Pour into the apple butter. It will bubble and harden immediately. Stir it in (along with the crystallized scrapings from the cooking pan). It will melt and blend with the apple butter. Cook until thick. Can in boiling water bath canner, 10 minutes for half pints. My yield was eleven half pints. Nothing difficult here. After I measured out the 12 cups of applesauce for the apple butter, I added the year's last blueberry picking to a couple cups of it, whirred it smooth in the blender, then stirred it into the remainder of the applesauce. It was heated and canned as for regular applesauce - 20 minutes in a boiling water bath canner for pints. It's a very pretty color, don't you think? I got about five pints of this, and also used the last of my regular mouth Tattler canning lids. And I'm still not done with the apples! That's ten dozen in use! Definitely need to get some more. My grandmother cooked down her apple peelings and cores to make apple butter. It makes a surprisingly large amount. You add water to the peelings and cores; then cook until the flesh of the apples starts coming off the peelings. Then I ran my mixture through the tomato separator which spits the seed and skins out one side and the pulp and juice out the other. Add your spice blend and keep cooking. Works for raspberries, too; if you want to make seedless raspberry jams and syrups. Mom says Grandma did the same thing with peach skins and pits to make peach butter but I haven't tried it. I'm assuming they were cling peaches. Happily there was a little leftover of each and I can officially say they're great! I've heard of people cooking down cores and peels for jelly, but didn't realize it could be done for apple butter (or peaches for that matter.) I would have liked your grandmother! Those are the kinds of frugal skills that society seems to be losing. Aren't the Tattlers great? I ordered some extra rubber rings to have on hand as well. I'm not sure how many cannings they can go through, but so far so good. We have the three old trees of an unknown variety. I gathered a final total of 12, 5 gallon buckets of fresh windfalls and lost count of the picked apples. Plus we ate fresh apples almost everymeal. Fried apples at breakfast too. I am using applesauce as a sweetener in baking. Any pulp and peeling went to the chickens. It's a win win, they love the scraps and our June/July feed bill was tiny. Plus I made goody bags of bits to freeze and have on hand next summer for hot weather chicken treats. I am gifting extra apple butter for Christmas! 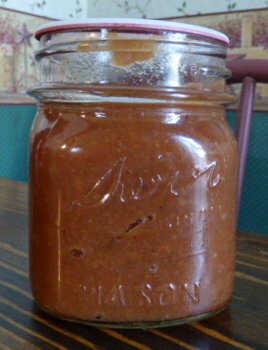 I am going to try your caramel apple butter, I suspect it would make fabulous sundae topping! God bless your farm! I still have apple butter from a few years ago. The sad part is that I can't get my family to eat more than a spoonful out of each jar they open. sigh. My daughter's voice teacher has a peach tree that they don't bother picking...the birds and squirrels are munching on fermenting fruit now. Oh yummy looking Leigh. I have that Ball Blue book and apples and pears are just coming here on the left coast. We have two Pink Lady semi-dwarf trees we planted early summer. One has a little apple on it but I'm guessing it will be a couple of years more before they produce assuming they survive. Caramel sounds good! 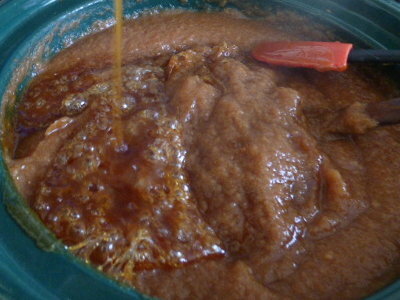 My fave thing to add to homemade (canned) applesauce is the last of the apricot puree from the freezer (also homemade). Awesome use of natural color! I like to use Elderberry to color the weird green foods: green grapes, rhubarb or green gooseberries. Get to it on those Tattler lids! Fiona, that's quite a haul! Do you have a cider press? I'd love to have one except they are quite pricey. Maybe someday. Sounds like you have crabapples! Have you tried them for apple jelly? You likely wouldn't need to add pectin Then you could make apple blackberry jelly too! I can't imagine having a fruit tree and not harvesting the fruit! Maybe you need to use the apple butter as an ingredient in something. I've used it to make muffins - yummy! Theresa, I imagine you have more consistent temps and rainfall than we do, so hopefully you'll start to harvest earlier than it took us. I did pretty well last year, but this year has been the best so far. Oooo, apple/apricot sounds really good too! The color is really better than the photo! I hadn't thought about using elderberries to color anything, but that's a good idea. Is it possible with anything that has caramel in it to be bad? Our little apple tree is struggling along. Hopefully next year will be the year of the fruit. The drought didn't help the first year it was planted and now at year two no sign of fruit. We have been under constant assault by the ground squirrels who have managed to put quite a dent in the whole guardian in addition to eating my entire crop of almonds and most of the peaches. Sigh. apparently my laptop has a mind of it's own today. That should have been garden in addition to . . . .
Of course, our apples up here in northern Minnesota aren't ripe yet but IF we get time for them to mature before Jack Frost comes calling this fall, it looks as though we will have a very good harvest. We don't care much for apple butter but eat a lot of applesauce (even a little dish for dessert often) and I make mine with very little organic cane sugar also. I'm definitely going to add some blueberries to a batch when making it this time around. Why haven't I ever thought of that?? LOL, I was wondering about the guardian! Sounds like you definitely need one for your almonds and peaches. I was surprised we did so well with fruit this year. We had a rainy winter but thet 2 month drought in the upper 90s as tough. Thankfully it rained at just the right time! I surprised myself by thinking of it. I've been canning pear applesauce and fig applesauce, so I thought, why not? I also tried canning apples like canned peaches or pears. I've never bought it that way but found instructions in the Ball Blue Book and again, thought why not? It will be a nice change from canned figs and pears. Nancy, I thought about you and your chunky applesauce as I was running the cooked apples through the food mill. By next year you'll be all settled into your new home and ready to get back to gardening and applesauce! When I lived in the foothills of the Sierra Nevada Mountains, back in the 1960's, we used to have apple butter every fall. There was a place in the mountains called "Apple Valley" and we would drive up there to see the blossoms. They had little orchard stores and we always got apple butter. I have never seen it for sale here in the Smokey Mountains. Harry, Hendersonville NC is apple country and there are quite a few orchards and stands this time of year. There's also a nice one on the Blue Ridge Parkway near Spruce Pine. Whether or not they carry apple butter I don't know! I like mixing cranberries into my applesauce. Just the right amount of tartness! The caramel apple butter looks awesome! I've read of a woman who used her Tattlers for more than 40 years! I think the rings might get hard when they are usable... I didn't see anything on the website, did you? Matty, yes, they do sell just the rubber replacement rings. It's on the Tattler website here although think I got mine from Amazon. I found the best deals for bulk on eBay. You just have to compare prices (making sure to choose a seller who offers free shipping). The mint, rosemary and pelagonium sound like a lovely addition. It's true though about how long the stash can last with only one person eating it! Cranberries is another great idea, thanks Laura! It's early for apples here - unless I've lost track of time again, which is the only reason I can think of that there didn't seem to be an August - but that caramel applesauce sure sounds like something I ought to consider making in a while!